Step 1 - Give us call! Some calls we receive from customers are undecided as to how to improve their playground space to offer the maximum play experience for their pupils. Others on the other hand have a budget to spend and a very clear vision of what they want. We value all calls and enquiries and we love to discuss your individual needs and requirements. We offer a FREE consultation and quotation service. An appointment is made for David to come out to meet with you and your staff/pupils to discuss your plans. During his visit David will listen to all your ideas, assess and measure your play area and discuss the possible options available to you. 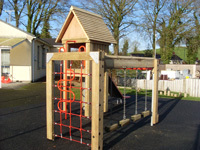 We provide play equipment, carry out ground works and can arrange suitable surfacing options. Shortly after the visit you will receive an FREE Auto CAD colour drawing of your site, clearing showing the layout of the products along with a quotation. We appreciate any feedback you have as this can be just a starting point. We amend the drawings until it meets your requirements. Once you are 100% happy we will start to work on your project. Every order is unique and our dedicated team of craftsmen carefully hand make and hand paint each item to a finish of your choice. Our lead time is 6-8 weeks from date of order. We arrange installation at a date that suits you. Our team of experienced workmen will come and personally install your equipment ensuring it causes the least disruption possible to your school. We will not leave your site until you are 100% satisfied with the quality and safety of our products. Not only will the products look great and add value to your playground, they will support your teachers in their teaching and enrich the play experience of each and every child. Your ideas and visions for your school have turned into reality!